Miranda Dickinson is one of those authors whose novels are right up my alley, and many are gracing my book shelves, but I hadn't actually gotten around to reading one until Take A Look At Me Now about a year ago. Her previous release was filled with scrumptious baked goods and enticing descriptions of San Francisco and reading it made me want to jump straight on a plane and visit the city by the bay myself. So when her new novel, I'll Take New York, arrived in my mailbox for review, I was very excited to read it, expecting to once more be dazzled by descriptions of an American city that would have me eager to Google the first available flight there – and I wasn't wrong. British Bea James owns a bookstore in New York with her best friend Russ. She has been together with her unreliable boyfriend Otis for ages and more than once has she almost given up on their relationship. Until it seems that he is finally ready to show his commitment to Bea and pop the inevitable question. However, when once again she is let down – and even worse, she's humiliated in front of her family – Bea has finally had enough and she breaks up with Otis. Psychiatrist Jake Steinmann is going through similar relationship problems: his wife has asked for a divorce, and most of their shared belongings in the process. 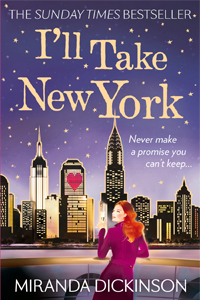 Devastated at the unexpected turn of events, as he still loves his wife dearly, Jake packs up his bags and moves back from San Francisco to New York, where his family is – trying to make a new start for himself away from all the memories of the life he shared with his wife. When Bea and Jake meet at a party their conversation soon turns to their heartbreak and determined to not be hurt again they create a pact: they will never get involved with anyone ever again. Instead they'll relish their single status and do everything you can't do when you're stuck in a relationship; going to the cinema by yourself and eating all the popcorn, watching five episodes of a box-set in one go and, most of all, explore New York City like seeing it for the first time. But of course giving up on love is easier said than done. I'll Take New York was a sweet read for a lazy Sunday afternoon. Bea was a lovely main character and I adored her bookshop, especially when she started to organise events there – I definitely want to have my birthday party in her shop too! I also thought that the storyline with her grandmother, who sent her gorgeous packages wrapped in hand-drawn paper and containing books with wise words highlighted in them, as well as letters describing her own heartbreaking love story set against the backdrop of the war, was a beautiful addition to the novel. And Jake, excuse me while I take a moment to swoon over this perfect specimen of a man! Where I thoroughly disliked Otis and was really irritated by supposed best friend Russ as well, Jake was the knight in shining armour that Bea needed at a difficult time in her life. Even as 'just friends' and while dealing with the emotional devastation of his divorce, he was there for her whenever she needed him to be. And it worked both ways, Bea too was a great support to Jake when he was struggling with the aftermath of his wife's sudden decision. While both main character were an utter delight, once again it were the enticing descriptions of the setting that made this novel such a stand-out to me. The pages were doused in a love for The Big Apple and reading about all the wonderful places Bea and Jake visited on their mission to rediscover the city made me want to jump on the first flight across the Atlantic Ocean myself. Miranda Dickinson really has a flair for transporting the reader to a foreign location, making this the perfect escapism read when you just want to get away from the stress and busyness of every day life. And if you're already a fan of the author, you'll be particularly excited to know that the novel also features the two leads from Miranda's debut, Fairytale of New York. While I haven't read that book myself yet, the glimpses we got of these characters made me very keen to check it out. I'll Take New York was a tad predictable on the romance front but this was more than made up for with the wonderful leads, the love for books radiating from the pages and the enticing descriptions of the setting, which made me want to return to NYC in an instant – it is the perfect feel-good novel to dream away with on a rainy Sunday afternoon.